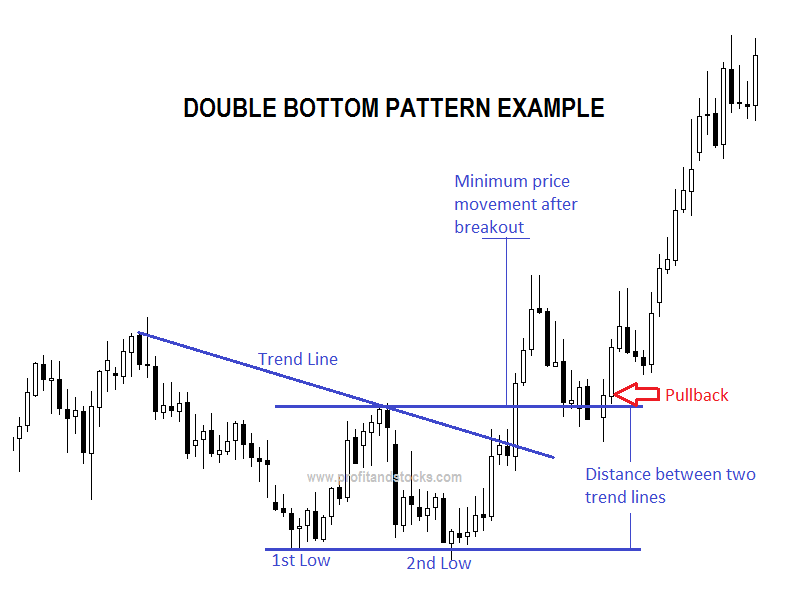 Double bottom is a trend reversal chart pattern formed after prolonged downtrend. Let’s look at picture shown below, At point A, the downtrend is proceeding as expected with no signs of a bottom and takes corrective push up to point B, Then market dips again to point C, and isn’t able to reach the bottom of the previous trough at point A. 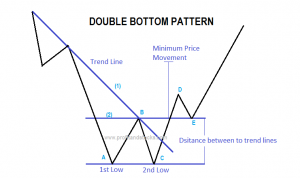 To continue an downtrend, each low point must be lower than previous one. The failure to break previous low at point C fulfils half of the requirement for equal low. By this time, the major down trend line (1) has already been broken, usually at point B, constituting another danger signal but, despite all of these warnings, all that we know at this point is that the trend has shifted from down to sideways. This might be sufficient cause to liquidate short positions but not necessarily enough to justify new buy. By this time, a flatter trend line (2) can be drawn under the last reaction highs, which is called a neckline.The market has now violated the trend line (2) along the top of points B, completed the requirement to, a new uptrend-ascending peaks and troughs. 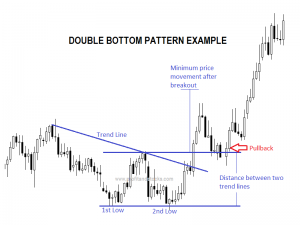 The new uptrend is now identified by the higher highs and lows at points C, D, and E.
It is very fairly common to see a pullback near to neck line after formation of the pattern. It should generally be seen as a healthy thing as it gives better confirmation of neckline as support. In some case the pull back may happen few times. 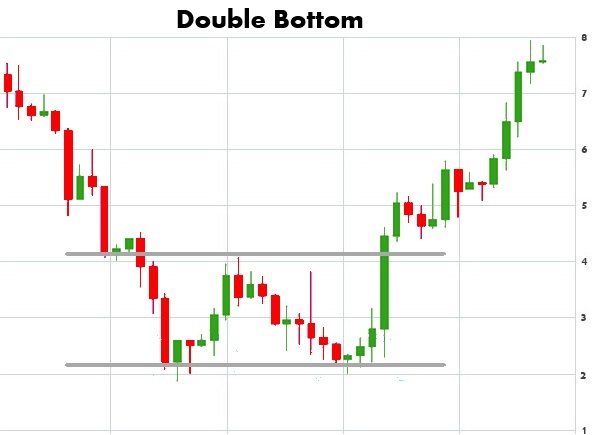 If this happens too many times then it may not be typical double bottom pattern. In case of pullback it is recommended to keep a stop loss of about 3% below neckline. Volume in double bottom has a lot of significance as it can help to confirm formation of the pattern. 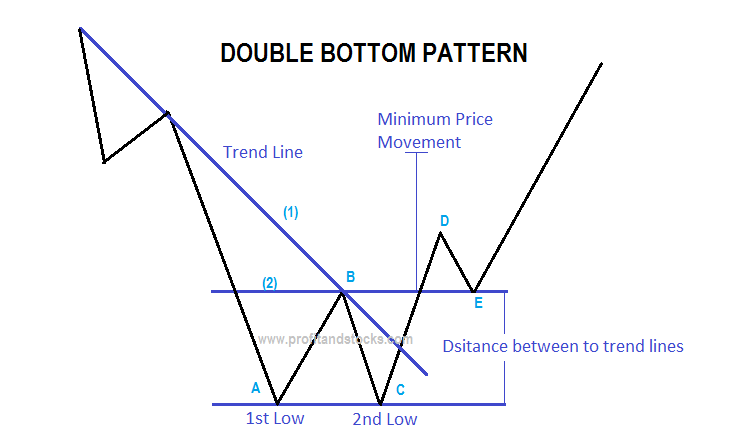 Volume during first bottom should generally be much higher than volume during second bottom formation and volume during midpoint formation should be much lower than volume during neckline break out Please avoid aggressive positioning when volume is not supporting the move. For aggressive traders a strict stop loss is recommended.